Did the earliest supermassive black holes slow the growth of the rest? Supermassive black holes at the centres of galaxies grow by swallowing gas from their surroundings, which ignites a powerful cosmic event known as a quasar. Observations of distant quasars reveal that some black holes had already grown to billions of solar masses before the Universe was even one billion years old. A new study suggests that these first monster black holes slowed down the growth of those that formed later, by heating intergalactic gas to thousands of degrees with their quasar light. Such a cosmic climate change may help explain why the most massive black holes are relatively rare despite having formed early. Fig. 1: An artist’s interpretation of a quasar. Gas falls into the supermassive black hole at the centre of this galaxy, making it grow even more massive. As it falls, the gas speeds and heats up, making it shine brightly. Fig. 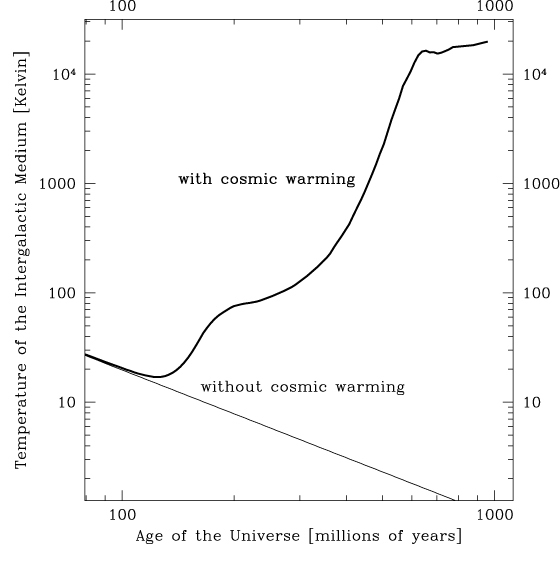 2: The temperature of intergalactic gas, shown with and without cosmic warming by (mini-)quasar X-rays. 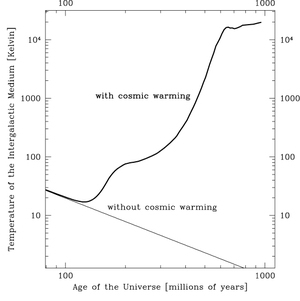 The thin line indicates the temperature history if there were no heating and the Universe would cool simply by expanding. 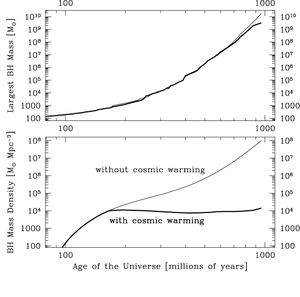 In the presence of heating, the temperature rises to 20,000 K by the time the Universe is one billion years old. Fig. 3: The growth histories of supermassive black holes for two simulations, one that accounts for the cosmic warming by (mini-) quasar X-rays (thick lines), and one that does not (thin lines). Top panel: The growth history of the most massive black hole in each simulation. Bottom panel: The total density of all black holes in the centres of galaxies. Cosmic warming only slightly affects the growth of the most massive black holes, but drastically reduces the universal density by stunting the growth of smaller black holes. At the heart of virtually every galaxy sits a monster: a supermassive black hole with a mass millions or even billions of times that of our Sun. When dense gas falls into a supermassive black hole, it heats and lights up, much in the same way that water in a waterfall becomes more energetic as it falls. The resulting “quasar” (short for “quasi-stellar object”) can outshine entire galaxies for millions of years (Figure 1), making them some of the most distant objects astronomers can observe. Because their light has travelled a very long time to reach us, they are excellent astronomical tools for studying the Universe’s past. Observations of the farthest quasars reveal that supermassive black holes weighing billions of solar masses were already in place when the Universe was less than one billion years old. Where did these monster black holes come from, and how did they become so massive so quickly? The first one billion years marked the rise of the first stars and galaxies. The Universe was expanding and cooling after the Big Bang, and clumps of matter were collapsing under their own gravity. Gas in these clumps formed the very first stars, and then the first galaxies. The ancestors of the monster black holes probably formed alongside the first stars and galaxies, either in the explosions of massive stars or through direct gravitational collapse of giant clouds of hot hydrogen gas. The very first black holes in the centres of galaxies would have had tens or perhaps hundreds of solar masses in the first scenario, and tens of thousands of solar masses in the second. Regardless of how they began, astrophysicists agree that in order to become supermassive so quickly, the giant black holes powering the most distant quasars must have gained most of their mass by consuming gas from their surroundings at a very high rate. 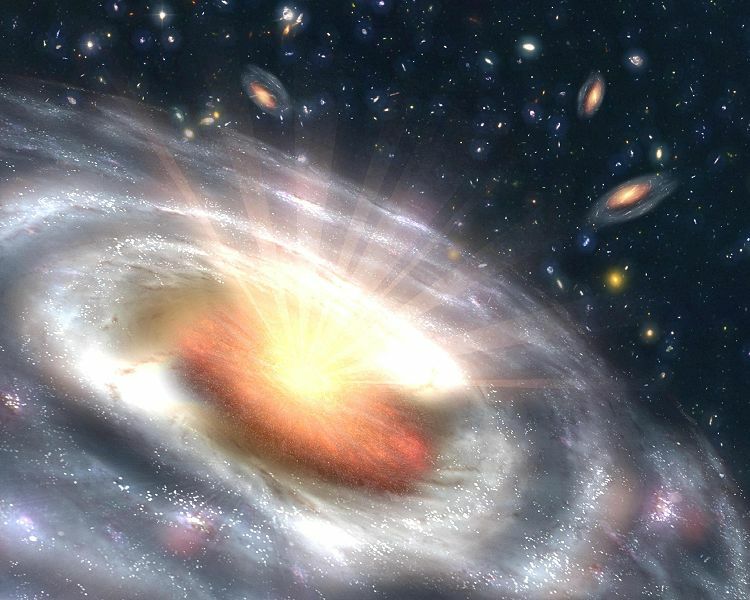 This would mean that the early Universe was filled with powerful quasars powered by their fast growing black holes. The very first quasars (or rather mini-quasars, since the black holes were not yet supermassive) would have emitted an enormous amount of light. In particular, they would have produced a lot of X-rays, which have very high energies and escape easily into intergalactic space. Previous theoretical studies have shown that the X-rays from the growth of the first black holes could have heated intergalactic gas in the early Universe to thousands of degrees. This is significant because gas must be cool and dense not only to form stars and build up galaxies, but also to fuel the growth of black holes. A new study led by Takamitsu Tanaka at the MPA investigated whether the “cosmic warming” caused by the growth of the first supermassive black holes could have affected the population of massive black holes in general. The authors used a novel technique to simulate the formation and gas-fuelled growth of the earliest massive black holes, their X-ray production, the resulting heating of gas in an expanding Universe, and the effects of this cosmic warming on the supply of cool, dense gas needed for further black hole growth. These calculations showed, for the first time, that the warming of intergalactic gas by the first (mini-)quasars (Figure 2) can indeed stunt the growth of supermassive black holes throughout the early Universe (Figure 3). 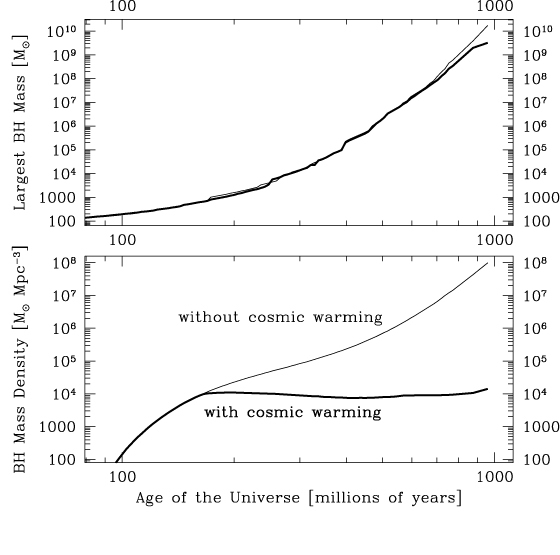 Ironically, the very first black holes that are mainly responsible for this warming are the ones least affected by it. By the time that they have heated intergalactic gas significantly, their galaxies have also grown larger and more massive. These massive galaxies can still maintain cool central gas temperatures when exposed to the hot extragalactic gas. Moreover, they collide more often with other massive galaxies, which can provide a fresh supply of cool gas. Black holes that formed later sit in less massive galaxies and end up being the victims of the cosmic climate change caused by their older brethren. Thus, the cosmic warming of intergalactic gas caused by the first generation of supermassive black holes may explain why so few black holes grew to billions of solar masses. Because this warming also suppresses the formation of small galaxies, it can further help to explain why “dwarf” galaxies are rare in our local Universe.